1. Last Saturday we braved the snow to go see Phantom of the Opera. It was the one show of the season that I really, really wanted to see. SP cleared our driveway, our road was fine, the problem was when we got on the so called main roads. Sigh. Given that it had stopped snowing/slowed down for almost 2 hours prior to our departure, the condition of the roads was abysmal. The worst roads? City of Pittsburgh Cultural District. They were a mess of 3+ inches of dirty gray slush crap. Can you see the wheelchair tracks in the above photo? It's a good thing I had SP to drag me backwards through the mess because there was no way the wheelchair could have made it through going forwards. 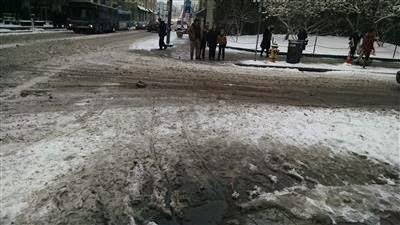 The front wheels would have been stopped by the slush and ice chunks. After we made it across, I took a photo. 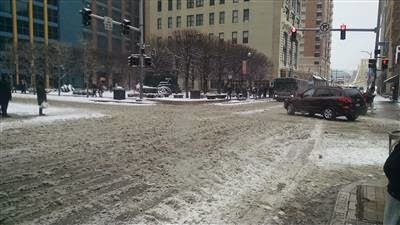 Given that there were 2 performances of Phantom of the Opera, 2 performances of My Fair Lady, and a Fiddlesticks show that I know of, all in the Cultural District, it's disgraceful that the roads in that area were in this condition. It was very difficult for people to walk across these streets. But Phantom of the Opera was fantastic! I'm just sad we had to cancel our dinner reservations at Butcher & the Rye - after the show we decided to head home before the snow started again. 2. Today is SP's birthday! He got to pick his dinner, which we made & ate last Sunday and we're eating the leftovers tonight. He chose lamb chops. Sunday afternoon he successfully chiseled the grill out of the ice against the house so we were able to grill them. We grilled 10 chops, from Costco, and ate 5 on Sunday. We'll eat the other 5 tonight. We also made breaded chicken for this week. Our sides for the week are roasted asparagus, sauteed green beans with lemon, and macaroni & cheese. 3. What about dessert/birthday dessert? Well, yes, there will be birthday dessert tonight, but it's a surprise for SP. All I will say is that my mom & I slaved away in the kitchen this morning making it. I hope he likes it! 4. This terrific way below normal temperatures winter weather has our furnace running a lot. That means the house is dry, dry, dry. The furnace humidifier and our bedroom humidifier are just not enough. My skin is so dry and worse, my eyeballs are dry! I've been putting drops in to help, but it's not helping much. The skin around my eyes is so dry that I am moisturizing every few hours, blowing through the expensive eye cream. My nose is dried out and constantly on the verge of bleeding while SP has been getting nosebleeds. My dry nose is also making me breathe through my mouth, which makes my throat dry, so I'm guzzling water because my throat is constantly dry and sore. I can't wait for warmer weather and less/no furnace! 5. Tonight is the finale of How to Get Away with Murder! So excited! 6. SP has never seen The Sound of Music. That boggles my mind. We need to fix that.